Based on the adventures of comic strip characters Calvin & Hobbes, this award-winning playground design features climbable creatures and crater-marked topography that might be discovered in an imaginary alien world. 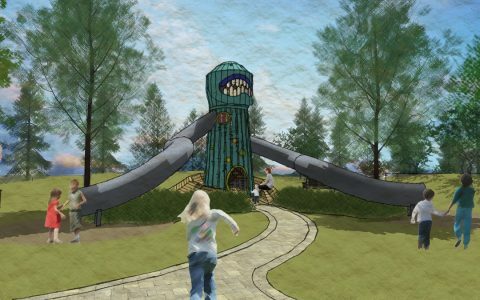 The UFO themed playground tells the story of Becca Space Girl – an intergalactic nomad marooned in an unsuspecting park after her spaceship crashed landed. The damage from impact left the landscape marred by climbable craters and a slide tower left from the wrecked fuselage from her spacecraft. Becca meets a spider companion and together they set up a satellite dish to communicate with home. All of the elements offer endless opportunities for high play value experiences while Becca patiently waits to make her long journey home…but fear not, as that could take eons.